At a knitting-group get-together last summer, my friend Gina shows up with two bags of yarn and asks, “Does anyone want these?” Some time earlier, she had bought two six-skein sets (one in green tones, one in pink/mauve tones) of a Cherry Tree Hill handpainted yarn called Wool in the Woods, thinking she’d make sweaters with it. It’s a beautiful yarn–the colors are amazing, and there are tiny gold threads running through it that offer some subtle sparkle. But when she got it, she wasn’t sure that she loved it, and after a while decided to clear it from her stash even though she still kind of liked it. At this moment, I came up with a Brilliant Idea: “Hey, Gina! 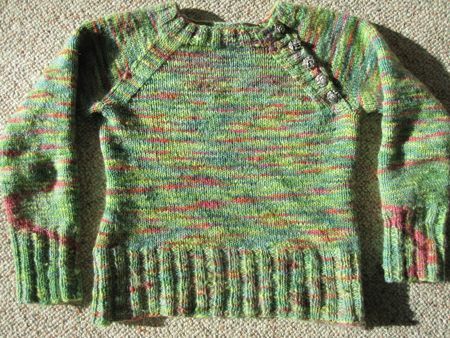 How about I buy the green yarn from you, you keep the pink yarn, and we have our own little knitalong and knit the same sweaters?” She loved this plan, and we spent the next couple of days e-mailing back and forth about possible patterns. She found the winner: a bottom-up raglan that was in the Knitting-Pattern-a-Day calendar two or three years ago. I love this sweater. 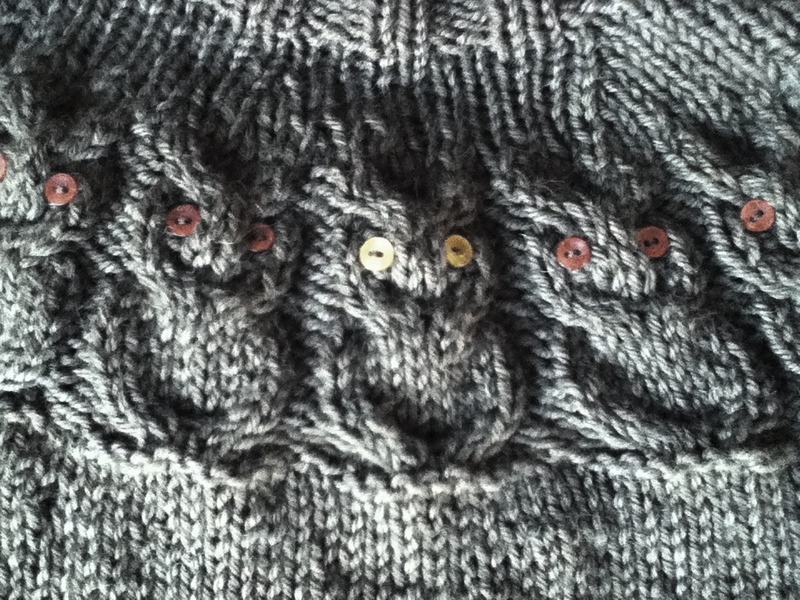 It was a fairly fast knit, and Gina and I both had ours done before cold weather arrived last fall. I think I’ve worn mine at least twice a week since then. Ever since SP9 ended, my spoiler, Lynnette, and I have kept in touch. One thing we discovered is that we’re both new to lace knitting–“new” as in “haven’t done it before but would really like to.” We also discovered that we both have a fondness for dragons. After a few e-mails back and forth to discuss several possible patterns (the “Heere Be Dragone” shawl was mentioned but quickly determined to be not-a-good-idea-for-a-first-lace-project), we finally settled on the Dragon-Scale Scarf from Heritage Yarns. By coincidence, we both started our scarves at the same time (around Easter weekend), but house-related concerns (and not having the scarf and my camera anywhere near each other whenever I thought to take a picture of the thing) have kept me from posting about it until now. As you can see, I’m nearly two feet into it (I started a new skein at about eighteen inches). I’ve opted for a heavier yarn than the pattern calls for: I’m using the fabulous Patons SWS that Lynnette gave me, and I love how the scarf is turning out. 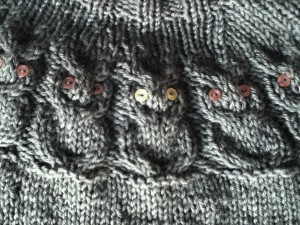 The pattern’s twelve-row repeat isn’t difficult but is interesting enough to keep me from getting bored! I doubt that I’ll be ready for Heere Be Dragone after this, but maybe one day, after I get a lot more lace knitting under my belt! Interweave Knits is hosting two events to celebrate their publication of Amy Singer’s No Sheep for You: Knit Happy with Cotton, Silk, Linen, Hemp, Bamboo, and Other Delights this month. The first is a No Sheep for You knitalong. 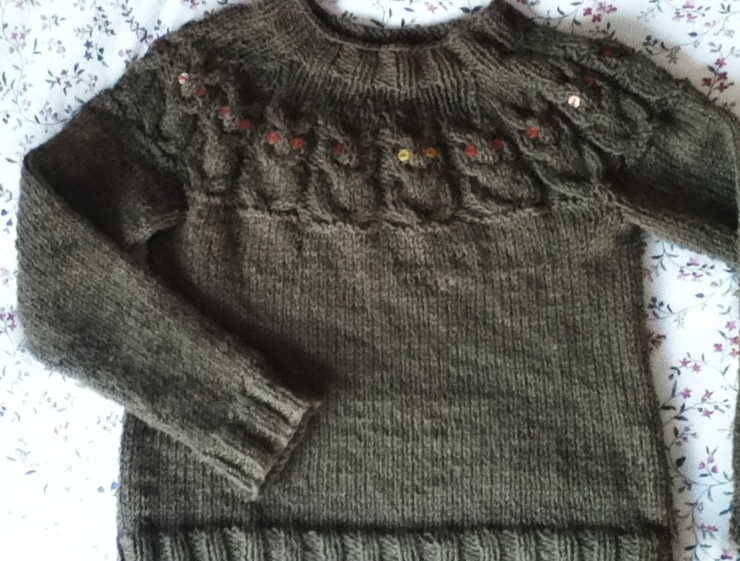 The second event is the “No Sheep Secret Pal Skein Swap“: each participant sends two skeins of nonwool yarn (one in June and one in July) to his or her pal. I happen to be a huge fan of wool, but for those of you who aren’t keen on wool or are allergic to it (or are knitting for non-wool-lovers), this book and these two events might be worth checking out!